Not a spider, but an Opiliones (Harvestmen, or Daddy Long Legs). Photo by Nash Turley. The “Big Bad Spider“: a wonderful post about why spiders might so often be featured (in art, books, culture) as monsters and villains. A spider’s egg sac does not always produce spiders. Always great to see more species of spiders described: in this case, some arachnids from Australia, including lovely Mygalomorphs. More on mygalomophs: this paper shows a radiation of cryptic, endemic species in California. Catherine Scott takes on the crusade of convincing people the spiders they are worried about are NOT brown recluse spiders. Good for you, Catherine! Spider book update: help decide what common species should show up in an upcoming book about North American spiders. Fortuitously, last Saturday was #SpiderSaturday. That’s awesome. Dan Johnson has been Tweeting some nice images and natural history about northern scorpions, found in Alberta, Canada. Varroa mites are well known to beekeepers. But how do they make their way into hives? ..by smelling like bees, of course. A small mite was clinging to the leg of a flying ant when it was trapped….forever…. Here’s is some simply fantastic biology and natural history about a desert-dwelling mite and its incredible feeding adaptations. This is my arachnological read of the week. Pseudoscorpions are among the most amazing (and understudied) of the Arachnids: small, wonderful animals with incredible biology. Catherine Scott wrote a simply terrific post about these lovely arachnids. Lyme disease is on the rise in Canada. Watch for ticks, folks. Poetry with a spider-theme. Here’s “A noiseless patient spider” by Walt Whitman. Here’s a photo and a bit of biology about a simply gorgeous Tarantula species from Colombia. Black widow spiders in your fruit? here’s a post that dispels some myths. If you are visiting London: A museum does an exhibit on spiders. Want to learn about the Anapidae? (A family of spiders) – here’s a post for you. Of, you know, it’s just wolf spiders singing and purring. Terrific research, and FTW, this site also has sound files! Spiders and Lego. Is there anything better? Wonderful post and really neat experiment! Wow – some amazing natural history here about a parasitoid wasp that affects a spider so that the web architecture is modified. On the taxonomy side, here’s a revision of ant-mimicking spiders from the western Pacific. They are *very* nifty spiders. An important paper for spider taxonomists: Resolving the phylogeny of the Linyphiidae. The Velvet spiders: high society. Spiders raining down on Australia: this story got a lot of press last week. Ballooning spiders really are wonderful, and although “mass ballooning” events may not be that common, they are natural! 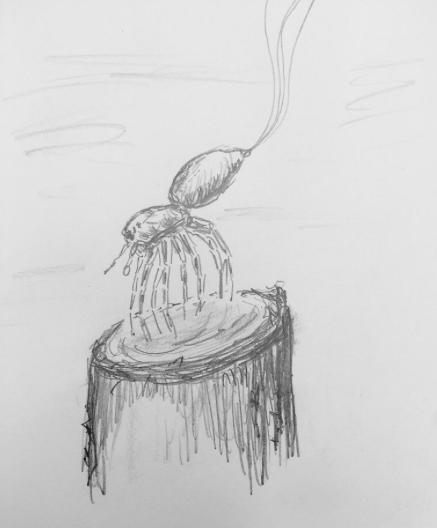 A quick sketch of what it looks like when a spider “takes off” by ballooning. Congratulations to Arachnologist Dr. Maggy Hardy for being the “@RealScientists” this past week. She did a great job tweeting about SO many wonderful things, including arachnids. Spider-themed paper is the Presidential Award Winner (best paper from 2014) from the American Society of Naturalists. Arlo Pelegrin posted another great tweet showing more great spidery anatomy. First record of the Pseudoscorpion family Cheiridiidae from Iran. You just don’t hear enough about Uropygids (whip scorpions). Here’s an overview of the Thelyphoninae. Canada is a big country, with an amazing diversity of habitats, from the temperate rainforests of Vancouver Island, to the polar deserts on Ellesmere Island. 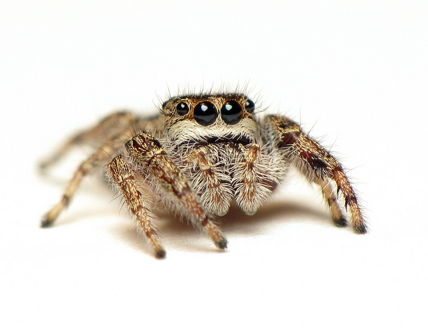 We are a country that harbours thousands of Arachnid species (yes, our eight-legged friends!). Some examples: the Yukon Territory hosts over 300 spider species and over 150 species of Oribatid mites; Quebec is home to well over 600 spider species. 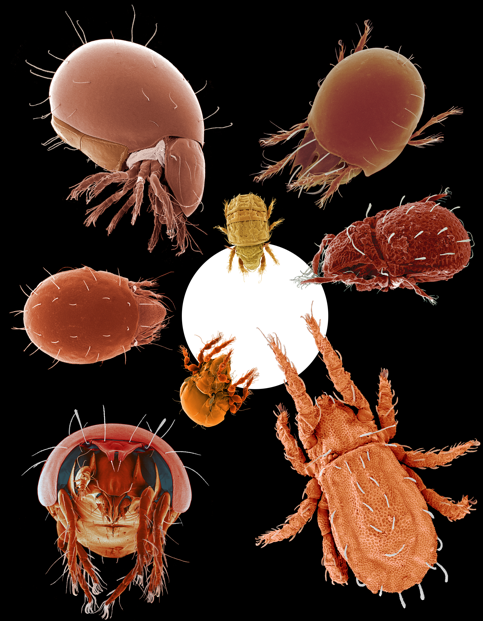 The Alberta Biodiversity Monitoring Institute has documented over 200 species of Sarcoptiformes mites from a relatively few number of sites in Alberta, and their work is far from complete. 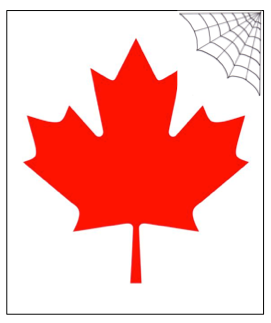 The Canadian National Collection of Insects and Arachnids in Ottawa has one of the best spider and mite collections, world-wide. A beautiful jumping spider. Photo by C. Ernst, reproduced here with permission. The general public is fascinating by Arachnids: my post titled ‘Spiders do Not Bite‘ continues to get hundreds of hits every week. We link comic-books and superheroes to Arachnids (even if the anatomy of spiderman is all wrong…). Spider silk is used to make dresses, violin strings, and has potential in pest control. There are invasive spider species that go unnoticed, yet may affect native species – as Bednarski, et al (2010) have documented in Maine. Spiders continually show up in grocery stores and cause alarm and fear (although mostly not warranted..). People are often picking ticks off their pets, or hearing about lyme disease. Everyone has a story to share about Arachnids. Recently, the Class Arachnida was a lunchtime topic of discussion in the lab. This discussion was in part prompted by an email I received from Leslie Brunetta. She asked the question about how we can promote Arachnology in University education. One way to do this would be for Arachnologists to agree to deliver guest lectures in organismal biology classes, and this got us into a discussion about how many people get paid to work on Arachnology in Canada. I tried to estimate the number of people in Canada who spend a significant portion of their time getting paid to do things with Arachnids – and I consulted a lot of colleagues to get this done. This would include academics with a research focus on Arachnids (from behavioural ecology to biodiversity science), and government scientists working on Arachnids (from systematics through to the use of mites as biological control agents). This does not include graduate students, nor does it include people working on short-term contracts. I estimate that fewer than 20 people are paid to work on Arachnids in this country. This is truly astounding and astonishing. Arachnids include two Orders that are among the most diverse on the planet: combining the Acari (mites & ticks) and Araneae (spiders) gives you estimates of well over 85,000 described species, globally. There are only a handful of Insect Orders that are higher. Spiders are key predators in agroecosystems (the classic paper by Riechert & Lockley 1984 is quite relevant!). Spiders eat mosquitoes, including those that can be vectors for malaria (Nelson & Jackson 2006) . Spiders are key prey for highly valued vertebrates (Gunnarsson 2007). Spiders can be medically important – their venom has remarkable potential for drug development (Rates et al. 2011). Mites are everywhere – they play critical roles in decomposition of organic matter (Kampichler & Bruckner 2009). Plant-feeding mites are economically important for dozens of crops. Follicle mites are in our heads (Elston 2010). Ticks can transmit diseases that are very important for human health and well being (Sperling & Sperling 2012). Ticks can hurt our beloved pets (Blagburn & Dryden 2009). Ticks can be harmful for wildlife populations (Addison et al. 1994). Arachnids are stunningly beautiful; they are among the ‘small and obscure’ creatures most worthy of study. In addition to mites, ticks and spiders, we can’t forget about Opiliones, Pseudoscorpiones, Scorpiones and other Orders… Arachnids should adored as much as Pandas, or the Mona Lisa. 8 Oribatid mites scaled to a 12 pt Times Roman period (0.5 mm dia.). Photo by D. Walter, reproduced here, with permission. You should visit his blog. Job openings in taxonomy have virtually ceased and research funding is stagnant. Canada’s international contribution to new species descriptions has fallen from 6th in the 1980s to 14th in the 2000s. Oh Canada. Where are your Arachnologists? I realize that many other taxonomic groups remain understudied – However, I am discussing an entire Class of animals! Could you imagine if I were discussing Mammalia, or Reptilia, or Insecta? There would be an uproar. Let us work to fix this. Let’s train excellent Arachnology graduate students, let’s lobby Departmental Chair, Deans, Bureaucrats in Government, members of Parliament, and whoever else will listen. MUST Listen. Our eight-legged friends need our help. Danks VH and JA Downes. 1997. Insects of the Yukon. Biological Survey of Canada. Paquin, P. & N. Dupérré 2006. The spiders of Québec: update, additions and corrections. Zootaxa 1133: 1-37.